NOTICE: Activation key must be used on a valid Steam account, requires internet connection. 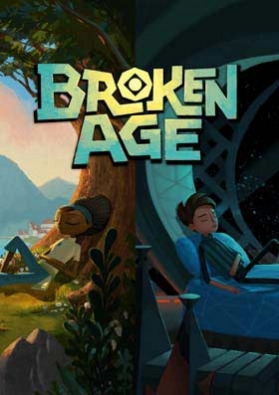 ABOUT THE GAME	The first graphic adventure by Tim Schafer in sixteen years, Broken Age began in a historic, record-breaking Kickstarter campaign. Now it's here in all its beautiful, 2D, hand-painted glory, with an original orchestral soundtrack and an all-star vocal cast. Broken Age is a timeless coming-… of-age story of barfing trees and talking spoons. Vella Tartine and Shay Volta are two teenagers in strangely similar situations, but radically different worlds. The player can freely switch between their stories, helping them take control of their own lives, and dealing with the unexpected adventures that follow. They said adventure games were dead, but then Broken Age punched its hand out of the grave and grabbed you by the wrist and you screamed just like in the end of Carrie except what you screamed was I love adventure games so much! And sorry I spoiled the end of Carrie. KEY FEATURES Pointing Clicking Original soundtrack, composed by Peter McConnell, recorded by the Melbourne Symphony Orchestra All-star voice cast, including Elijah Wood, Jack Black, Jennifer Hale, Wil Wheaton, and Pendleton Ward Dialog Trees! Some jokes. Unless you don't think they're funny, in which case we totally weren't trying to be funny. A whole bunch of awesome PUZZLES This one really hard puzzle that you won't get but you'll look it up online and not tell anybody All your hopes and dreamsSYSTEM REQUIREMENTS Windows Minimum: OS: Windows XP Service Pack 3 Processor: 1.7 GHz Dual Core Memory: 2 GB RAM Graphics: NVIDIA GeForce GTX 260, ATI Radeon 4870 HD, Intel HD 3000, or equivalent card with at least 512 MB VRAM DirectX: Version 9.0 Hard Drive: 1500 MB available space Sound Card: DirectX Compatible Sound Card Additional Notes: Must have OpenGL 3 with GLSL version 1.3Recommended: OS: Windows 7, Windows 8 Processor: Intel Core 2 Duo at 2.2 GHz, AMD Athlon 64 2.2Ghz Memory: 3 GB RAM Graphics: NVIDIA GeForce GTX 460, AMD Radeon HD 6850 DirectX: Version 11 Hard Drive: 1500 MB available space Sound Card: DirectX Compatible Sound Card Additional Notes: Must have OpenGL 3 with GLSL version 1.3. Some users may need to disable Steam overlay. MacMinimum: OS: Snow Leopard 10.6.8 or later Processor: Intel Core Duo Memory: 2 GB RAM Graphics: ATI Radeon HD 4850, NVIDIA GeForce GT 120, Intel HD 3000, or equivalent card with at least 512 MB VRAM Hard Drive: 1500 MB available space Additional Notes: Must have OpenGL 3 with GLSL version 1.3Recommended: OS: Lion 10.7.X Processor: Intel Core i series processor Memory: 4 GB RAM Graphics: AMD Radeon HD 6770, NVIDIA GeForce GTX 460 Hard Drive: 1500 MB available space Sound Card: Compatible Sound Card Additional Notes: Must have OpenGL 3 with GLSL version 1.3. Some users may need to disable Steam overlay. Linux	Minimum: OS: Ubuntu 12.04 LTS Processor: 1.7 GHz Dual Core Memory: 2 GB RAM Graphics: NVIDIA GeForce GTX 260, ATI Radeon 4870 HD, Intel HD 4000, or equivalent card with at least 512 MB VRAM Hard Drive: 1500 MB available space Additional Notes: Must have OpenGL 3 with GLSL version 1.3Recommended: OS: Ubuntu 12.04 LTS or higher Processor: Intel Core 2 Duo at 2.2 GHz, AMD Athlon 64 2.2Ghz Memory: 3 GB RAM Graphics: NVIDIA GeForce GTX 460, AMD Radeon HD 6850 Hard Drive: 1500 MB available space Sound Card: Compatible Sound Card Additional Notes: Must have OpenGL 3 with GLSL version 1.3. Some users may need to disable Steam overlay.